For better or worse, the release of Dragon: Marked for Death by the talented team at Inti Creates has been delayed until 31st January 2019 in both North America and Europe. The eShop title was originally due out next month on 13th December and has now been pushed back to launch around the same time as the physical version, which is being published by Nighthawk Interactive. There's no mention about when exactly the hard copy of the game will arrive, but the aim is for it to be made available as close to the eShop release as possible. The digital version will be sold in two separate packs priced at $14.99 each. The first is the 'Frontline Fighters Pack' containing the Empress and Warrior characters - friendlier to beginners with DPS and tank type heroes. The second one is the 'Advanced Attackers Pack' including the Shinobi and Witch - with more technical attacks and higher skill ceilings. Players can select either pack and then download the second pack as DLC if they choose to buy the game digitally. The physical edition will contain both packs, so there's no need decide which one you would prefer. 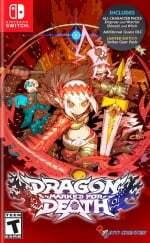 As previously noted, Dragon: Marked for Death is a side-scrolling action-RPG where players team up with three other people to take on 30 quests. There are four classes in total along with a story fueled by revenge. Inti Creates is previously responsible for games on the Switch eShop such as Blaster Master Zero and Bloodstained: Curse of the Moon. Are you glad or disappointed to hear this game has been delayed until early next year? Are you more or less likely to pick it up now? Tell us below. The two reasons I’m interested in this game are Inti Creates and Toru Nakayama (Mega Man Zero series). That is one bizarre digital release, it seems like you're effectively buying half the game. For that reason I think it's going to be worthwhile to wait for the physical version. This game has looked great since it was announced. They can take all the time they need. I’ll wait for physical. It looks good. I’m in no rush though, still digging through the backlog. @mauhlin12 I rather see the X series done with, since it was suppose to end with X5. I want Inti to work on a new ZX and finish the storyline of that series. I really enjoy inti creates games, i will wait for the physical release! @ilikeike I have a feeling it is to be able to dodge the price parity policy that Nintendo has. Similar to how Rocket League is priced differently on digital and physical for the Switch (by bundling DLC without affecting the base game price). I'm not satisfied with what I just saw. It is difficult to clearly explain why but globally, the game seems to be made with several pieces of unreleased games put together to build a new one. I have the sense that even the game is only made to get a maximum cash on the back of gullible players. I'm going to wait to see more, specially with a price of €30. I'm a fan of Inti Creates work and I'm liking the throwbacks to Mega Man Zero style character designs and cinematics, this is one I wanna get physical. Physical for me - Inti Creates have yet to disappoint me. Love to play through their games with each character. And 30 € seems really kinda cheap. Didn't mind to pay 55€ for Gunvolt Strikers Pack. They put a lot of love into their games and gameplay has always been fantastic. That's a bummer. Really looking forward to this game. I hope that it's as flawless as possible come January! So no single player option? Why is it being sold in 2 pieces like that? From how it reads you get the whole game minus 2 characters in one pack. So for the same price for the other pack all you get is two more characters? Shouldn't the 2nd pack cost less since it has a lot less? Is it just me or is this a weird way to release a game, even by DLC standards? Can we pre order the physical version somewhere? @Balta666 The first announcement trailer showed some solo-play footage so i assume there is a single-player option. Weird choice with the digital, but $30 sounds fine for the physical price. Inti Creates makes some of the most fun 2D games, right up there with WayForward in my book. I was hoping to play it sooner, but I'd rather it be as good as possible. Also kinda wish it was like, 25 for the complete game, the whole split character idea is strange. @ilikeike Doesn't really seem to matter. I can't see how it's a bad thing. Pay half as much, but get the full game and half the characters. If you don't intend to play through the game multiple times, seems only smarter to pay less. And you can always buy the other set as DLC later if you change your mind. What's the down side? @Dekar It's definitely odd.. But I can't fathom how it's bad. It was always going to be $30. Now it's $15 for just as much game but half the characters. And if you want all the characters, it's the same price as it was before. All it does is give you options. How could that be bad? @subpopz It's definitely weird. But how can it be bad? It was going to cost $30 to begin with. Now you have the OPTION of paying half as much. Besides, a lot of people won't play through it more than once. Also, there's no way to know that one won't cost less after you buy the first. As a matter of fact, Bayonetta 1 and 2 as well as Valkyria Chronicles 1 and 4 have discounts that pop up on the other one if you buy one, but it doesn't show that in the price until you buy it. And it doesn't have the listing lowered base, it just does a slash through the price and then looks like a "sale", but the sale never ends. Might work like that. PSA: I just bought the Advanced Attackers pack for $15 and the other version is no longer purchaseable. It says I can buy the other two characters in-game as DLC. I would wager that they probably are less money that way, too.